Farrar Straus Giroux, 9780374382544, 32pp. As the sun rises, the weaver begins her work, spinning thread, dying it, and then weaving it into a cloth along with the signs of love and friendship she sees down on earth. At the end of the day, the weaver spreads this extraordinary cloth over us, to warm and protect us all through the night. This is a joyful, soothing, gorgeously illustrated bedtime story about the love between family and friends all over the world--and even beyond it. 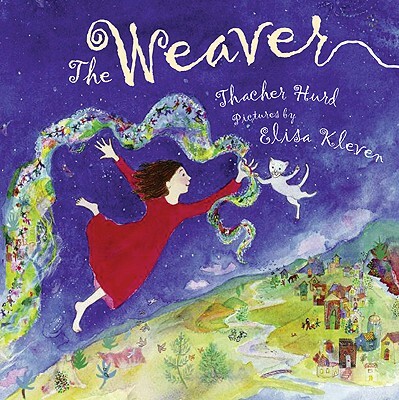 The Weaver is a 2011 Bank Street - Best Children's Book of the Year. Thacher Hurd is the author and illustrator of many picture books, including Art Dog (978-0060244248) and Mama Don't Allow (978-1591121350). He lives in Berkeley, California. Elisa Kleven's most recent books include The Apple Doll and The Wishing Ball. She lives in Albany, California.